Yesterday, at Honey Brook Golf Course the Lancaster-Lebanon League District qualifying tournament was underway. In the boys tournament, Brock Fassnacht of Warwick carded an even par 70 to win the boys championship. 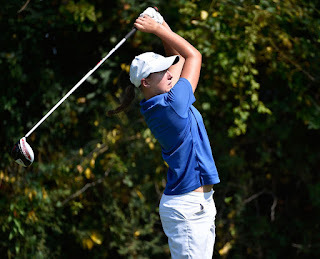 Ellen Wager of Manheim Township did him one better, the only golfer of the day to finish under par at -1.Wager’s teammates backed her up with several other nice rounds as the Streaks brought home their 18th LL League Golf Team championship and 8th in a row. During the regular season, however, Township garnered their 13th Section 1 championship. Cocalico came away atop Section 2 and Lancaster Mennonite Section 3. But enough with sections, this was the District qualifier. The top 20 boys made it to Districts along with the two alternates Lampeter-Strasburg’s Andrew Fink and Eastern Lancaster’s Ryan Woefling. The girls however are scored a little bit differently. To qualify for Districts the girls had to score 104 or lower. Only the top 13 girls on the league went to Districts this year. Including, the two L-S girls Katherine Lapinsky and Shannon Campbell. Others who qualified were Cocalico’s Evelin Cambel and Amala Moua, as well as Lancaster Mennonite’s Madisdon Bailey and Manheim Township’s Ellen Wagner and Erica Corey. It was an exciting day and will be more exciting when next Friday rolls around and everyone goes to LL League Districts at Briarwood golf Club in York. Play begins with a 10 am shotgun start and continues into the next day for those who qualify. Come support the Pioneers at Briarwood next week.